From the Administration Settings page in Interfolio Review, Promotion, & Tenure administrative users can enable or disable file downloads, enable or disable comments, create and edit forms used to collect information from candidates, establish case statuses for an institution, and set up committee voting options. The features and functions mentioned here are explained in more depth throughout this guide in various chapters, and where appropriate, information specific to your institution has been included. 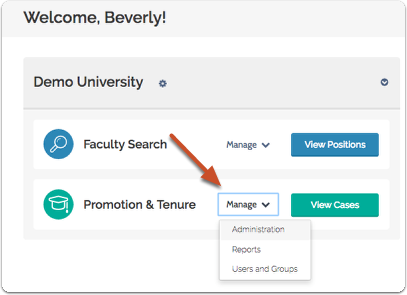 Click "Manage" on your Promotion & Tenure account dashboard and select "Administration"
The Administration Settings page appears as a tabbed interface. By default the page opens on the "Comments & Downloads" tab. 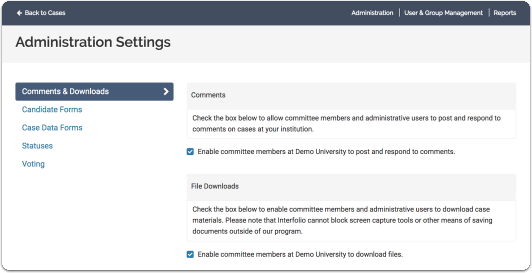 Check the box below to allow committee members and administrative users to post and respond to comments on cases at your institution. Check the box below to enable committee members and administrative users to download case materials. Please note that Interfolio cannot block screen capture tools or other means of saving documents outside of our program. 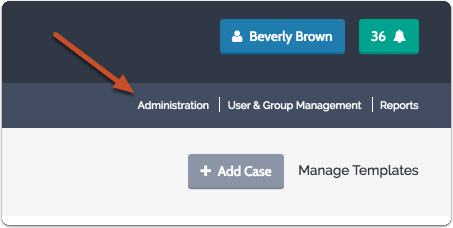 From the "Candidate Forms" tab administrators can create, edit and manage candidate forms which are are used to collect information directly from candidates. 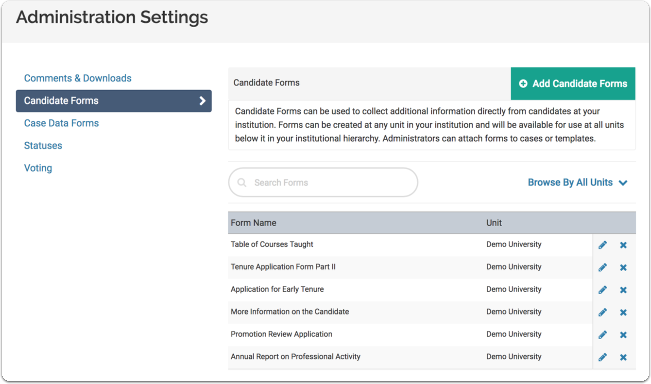 Candidate Forms can be used to collect additional information directly from candidates at your institution. Forms can be created at any unit in your institution and will be available for use at all units below it in your institutional hierarchy. Administrators can attach forms to cases or templates. 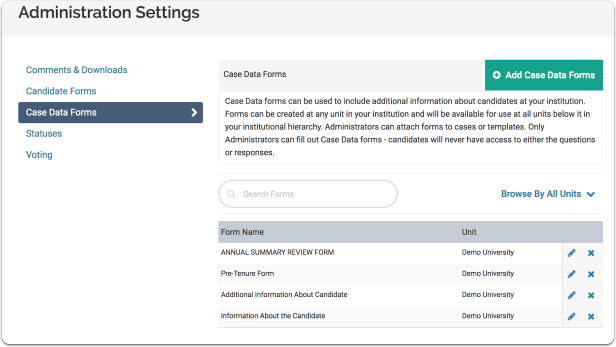 From the "Case Data Forms" tab administrators can create, edit and manage case data forms that can be used to include additional information about candidates at your institution. Forms can be created at any unit in your institution and will be available for use at all units below it in your institutional hierarchy. Administrators can attach forms to cases or templates. Only Administrators can fill out Case Data forms - candidates will never have access to either the questions or responses. From the "Statuses" tab Administrators can create a list of statuses that can be applied to any case at the institution. These statuses are meant for organizational and reporting purposes, so you can easily see where individual cases currently are, along with their ultimate outcome. Committee Managers and Administrators are also able to add custom statuses at the individual case level. From the "Voting" tab Administrators are able to collect the results of committee votes through Review, Promotion & Tenure. Admins or Committee Managers record the votes of a committee into RPT. These options are available to each committee at the institution and the results are tracked and reportable.